I’ll give you a minute to focus on these words while having those big, buttery, fluffy, walnut and brown sugar laced pancakes in front of you. I know it’s hard, it is for me too. My husband is not a big fan of pancakes. Or waffles. Or biscuits. Or really anything that’s too bready. Why did I marry him again? Just kidding, just kidding… he is amazing. 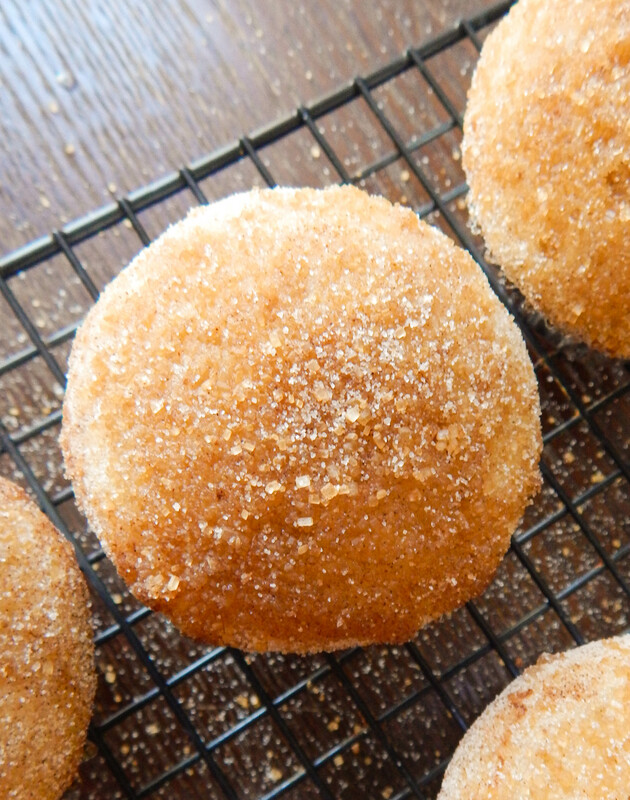 But when it comes to breakfast foods, we are total opposites. He would easily take sausage, bacon and eggs for breakfast any day while I am more of an oatmeal with toast or pancakes kind of girl. I actually cannot eat eggs. I have hated eggs ever since I can remember. I get it from my grandma, Lucia, I think. I don’t mind them if I can’t taste them, (like in cookies or pasta or wherever else eggs are needed) but I cannot eat scrambled eggs, hard boiled, omelets, sunny side up. I think you get the picture. Sometimes omelets look so good, especially when they are filled with veggies and cheese, but I just can’t do it. 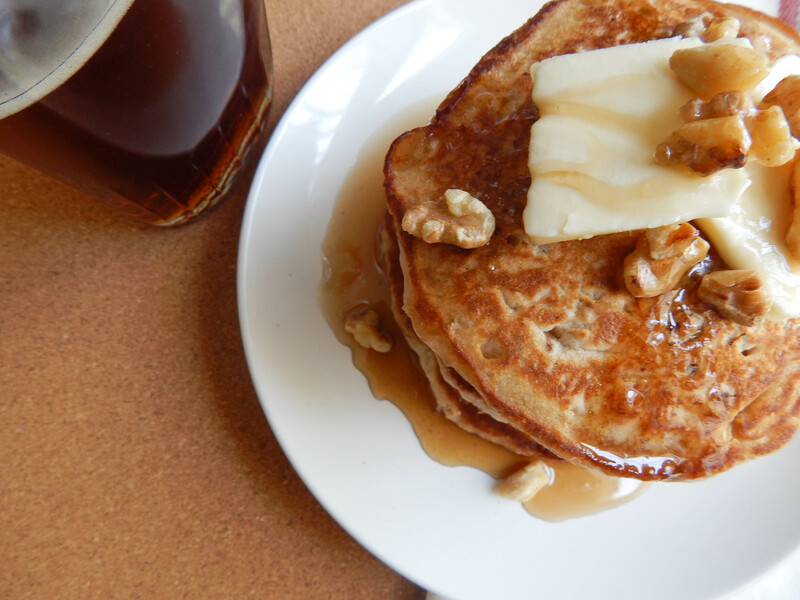 I whipped up these pancakes for a lazy weekend breakfast. I always have regular oatmeal and instant oatmeal packets at home. Right now I happen to have a giant bag of pancake mix because I bought it for the mini camping trip we just had with our friends and family. We ended up eating other things for breakfast and didn’t even open the bag, so I need to get very creative and use up some of the mix. Any ideas on what else I can do with it besides make pancakes? I shouldn’t complain because these pancakes turned out delicious! I used pancake mix (the kind that just needs water) and added in toasted chopped walnuts, light brown sugar and instant maple brown sugar flavored oatmeal. You could also use plain instant oatmeal. I like to buy the instant oatmeal packets that come in the box with a variety of flavors and have reduced sugar. Mmmm, yes. Pancake goodness! 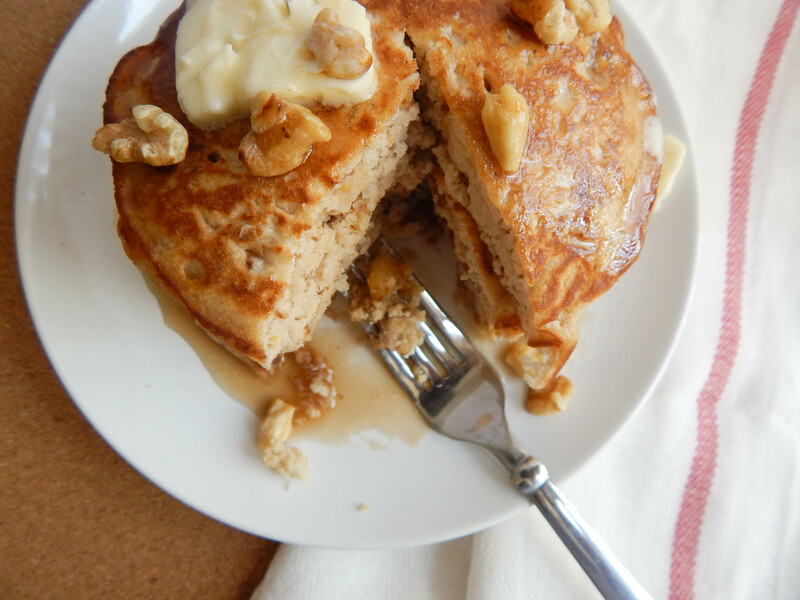 The oatmeal in the pancakes gives them nice hearty texture, and the brown sugar gives a little sweetness. They are puffy and thick, so if you are looking for thin little pancakes, this is not the recipe for you! 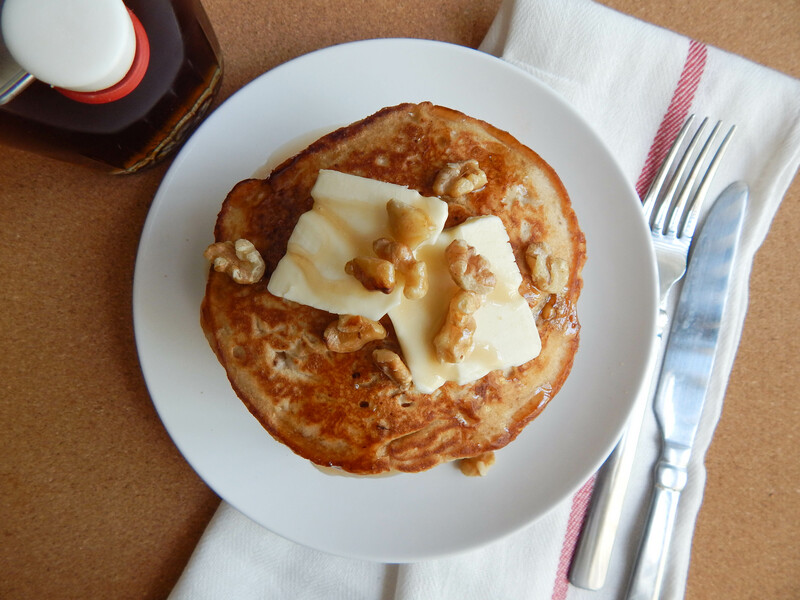 There are walnuts cooked right into the pancake, so you get a little bit of crunch here and there. I love walnuts! If I have a lot of them I will store them in the freezer so that they last longer. Before I use them I toast them up in a dry pan to develop their flavor. I enjoy pancakes the most when they have a deep golden brown color and toasty edges. 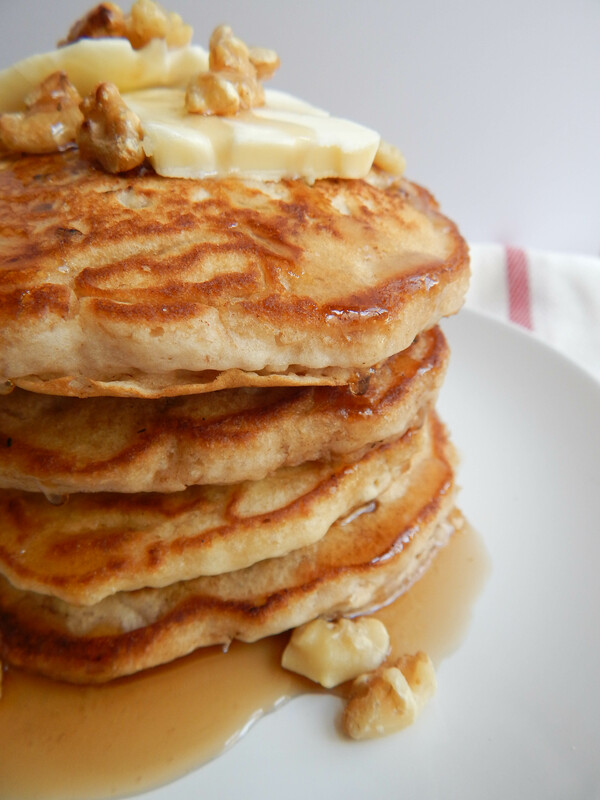 These pancakes are filling and satisfying. Totally amazing with a cup of hot coffee and some fresh fruit on the side. I enjoyed one and a half pancakes and saved the rest, because someone wanted chorizo and eggs for breakfast instead. If this recipe is being made for one person, I would recommend halving it so you don’t have leftovers. It is still a perfect recipe for one person, because it is quick and easy to make. 1. Add walnuts to a small dry pan over medium heat. Toast the walnuts slightly for 2-3 minutes, stirring occasionally. Watch them closely so they do not burn. 2. 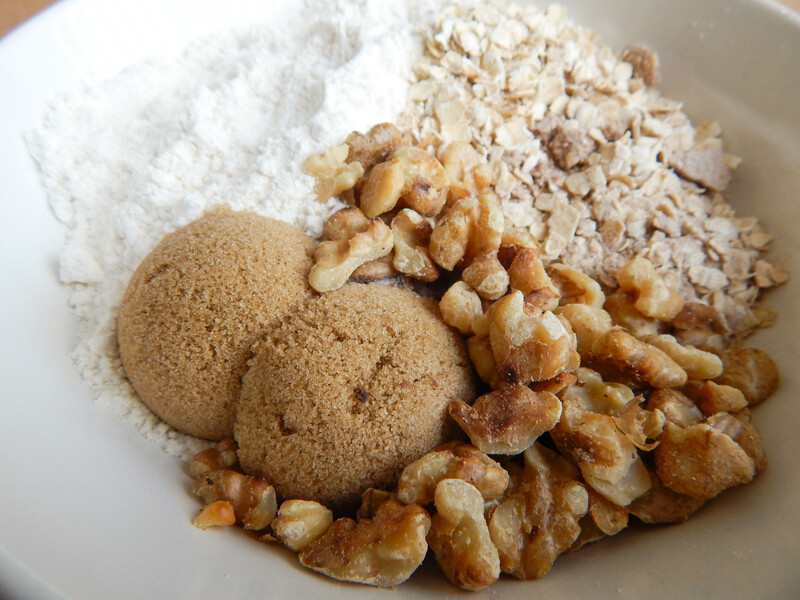 Combine all dry ingredients including walnuts into a mixing bowl and whisk together. 3. Add water and whisk together to combine. Do not over mix. There should still be a few small lumps. 4. Let your batter sit for 4 minutes. It will thicken slightly. 5. Heat your nonstick griddle or skillet to medium low heat and let it heat up. If your stove burns very hot you may want to set it at low. 6. Add as much butter as you would like to coat the skillet, and let it heat up for a few seconds. 7. Use a half cup measuring cup to pour the batter into the pan. My skillet fit 2 at a time. 8. Cook for one to one and a half minutes on the first side depending on how hot your skillet is. Take a spatula and lift the pancake a little to see if it is done. The bottom should be medium to deep golden brown. Since this is a thick pancake batter, you won’t see as many bubbles as you would with a thin pancake batter. 9. Take you spatula and gently flip your pancake over to cook the other side. The second side should cook in about a minute, again depending on your heat. 10. Take a dry paper towel and carefully wipe your skillet clean before adding the next batch of pancakes. Continue steps until all pancakes are cooked. 11. 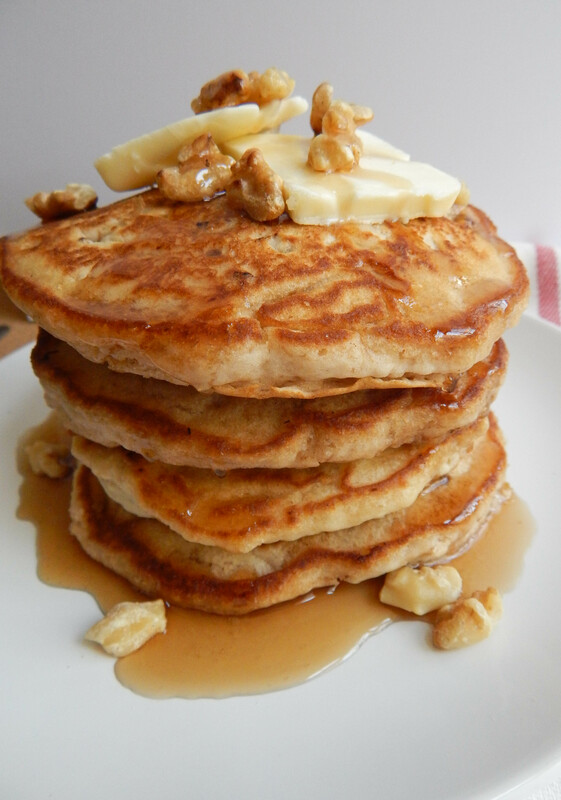 If desired, top pancakes with butter, walnuts and maple syrup. 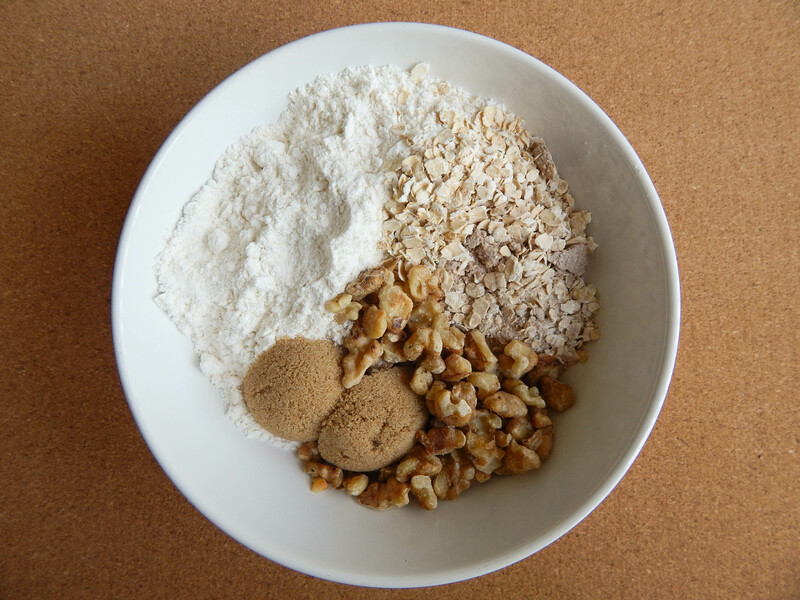 If you want to use plain instant oatmeal instead of flavored, you can add a little extra brown sugar to your mix. 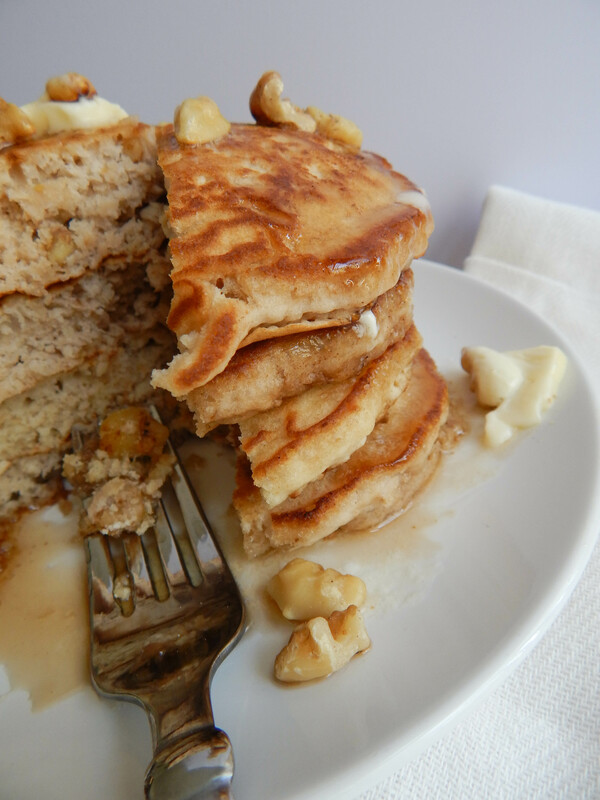 You may want to add less maple syrup to your pancakes than usual since the batter already has some sweetness to it!